There is something almost magical in the way that distinct ingredients may be transformed into a beautiful sauce, and the French are the world leaders in this department. Ever since medieval times, sauces have played a major role in French cooking: they are the crowning glory of French cuisine. Some — mustard vinaigrette, pistou or mayonnaise, once you get the hang of it — may be used any day of the week. 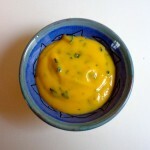 Others — beurre blanc or hollandaise, for example — are for special occasions. Once you have mastered them, variations are infinite and creativity a pleasure.